Sometimes I pick up books because I read the premise and I just know instinctively that I need to read the book proper to find out what the author has done with that scenario. 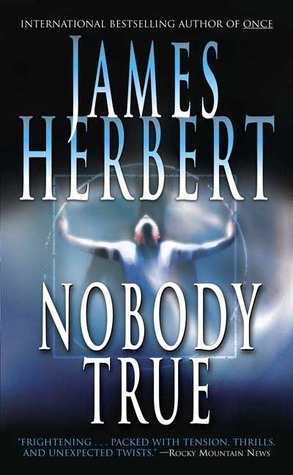 Nobody True was one of those books. Considering that my last encounter with James Herbert was mixed at best though, I was somewhat wary going into this, regardless of my enthusiasm for the premise. Nobody True follows Jim True, a man who is ordinary in all but one way: he has had incredibly vivid out-of-body experiences ever since he was a young boy. While he is on one of these out-of-body experiences, he returns to his body to find that he has been murdered and his body horribly mutilated while his spirit was away. He finds himself searching for his killer, but first he must figure out whether he was the victim of a serial killer who had similarly mutilated their victims, or whether his murderer was someone he knew and was close to. But even if he can figure that out, is there anything that he can actually do in his now-permanent incorporeal state if he does discover the culprit. I really wanted to like Nobody True, but I knew that it was a dud when the first seven chapters or so focused on his childhood from the age of 3 onwards and his career in advertising. If anything was an example of the importance of judicious cutting when writing a second draft, then this is it. I did not pick up a horror novel because I wanted to find out how the everyman protagonist started up his advertising business in excruciating detail. I want to see the everyman protagonist struggle with their own impotence and lack of importance within the universe. That fact that Herbert then proceeds to add footnotes that are both long-winded and almost wholly unnecessary to the actual plot only makes the proceedings all that more infuriating. I could have coped with that if the characters were half interesting. They really weren't. I mean, your main protagonist is a guy who actively wanted to be in advertising. There isn't really much you can do to save that character. Honestly, this is the most boring, white-bread character I've seen in a long, long time. I really couldn't care less who actually killed him. The fact that the serial killer that I mentioned previously is only evil because they have a physical disability is also really intensely uncomfortable and not in the manner that I had willingly signed up for.